New AMX video distribution solutions are the matrix Precis 8 × 8, driver AMX DCE-1, the climber SCL-1 and the DXLite transmitter. Harman Professional Solutionsbrand that it distributes AVIT VisionHe has announced new video distribution solutions designed to simplify the design and implementation of systems for corporate, educational and Government applications. Among the new solutions ofAMX include matrix Precis 8 × 8, the DCE-1 4 controller K 60, the climber SCL-1 4 K 60 and the transmitter DXLite Series 4K 60. "These products distribution of video of AMX help address these challenges with new solutions to manage everything from switching 4K 60 with video scaling, EDID management and CEC control, until the transportation distance", explains Paul Hand, Product Manager of Harman Professional Solutions. 8 × 8 précis 4K 60 matrix is a 4K 60 switching solution 4:4:4 with eight inputs and outputs HDMI. Four outputs also have outputs HDBaseT in mirror for direct connection to a display or projector that supports standard HDBaseT or for use with a Precis HDBaseT receiver. PRECIS is compatible with 4K 60 4:4:4 and HDCP 2.2 and includes dynamic audio decryption capabilities, offering a solution that is compatible with the latest sources and displays. DCE-1 4 controller K 60 combines control CEC, emulation EDID and extract audio into an economic device. This driver provides emulation EDID for resolutions up to 4 k 60 4:4:4, with the ability to copy from the exit or select from one of the 15 pre-programmed EDID. It also provides control of the power of the display by CEC or RS232, in response to a change in the input signal, as well as the embedding of digital and analog audio. Scaler small format SCL-1 4 K 60 sets the resolution of a video source to match it with the optimum screen resolution. This product of unique input/output may be used in combination with other products, such as local HDMI outputs in the AMX Precis 8 × 8, where the scaling can be used to optimize the experience. 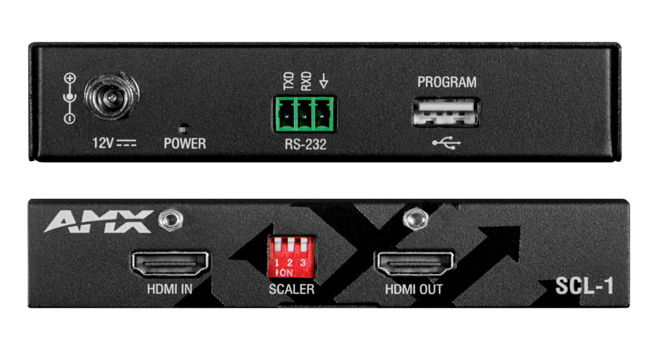 This scaler supports resolutions of input and output up to 4 k 60 4:4:4 and is compatible with HDCP 2.2 source. As the DXLite receiver, transmitter DXLite Series 4K 60 advantage HDBaseT technology to distribute audio, video and USB 2.0 through a single cable category. 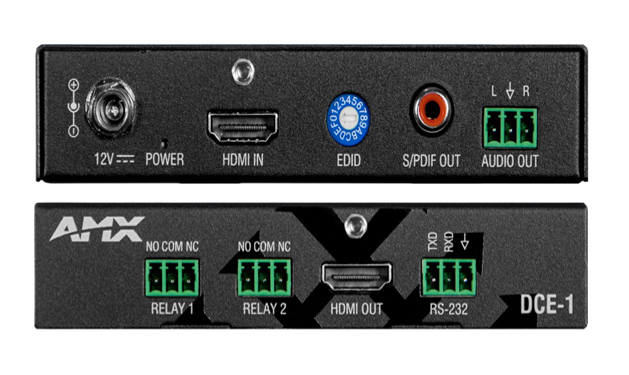 Admits 4K 60 4:4:4, HDCP 2.2 and HDR video, and you can use point to point (transmitter to receiver) or together with a selector of AMX Incite all-in-One presentations. With the USB 2.0 distribution integrated between the transmitter and the receiver, a USB device, as a sound AMX Acendo Vibe bar, mounted on the screen, can be connected to a laptop on the table, providing economic conferences in meeting Byod environments.